The PVRTX15UBT Carpeted 15” Five way Active Loudspeaker is Technical Pro’s most advanced and streamlined loudspeaker system to date. 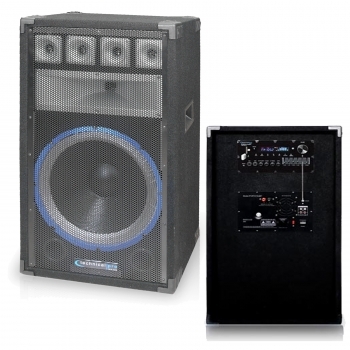 This amazingly powerful unit makes it easier than ever to put out the “big” sounds you need for outdoor, live or club venues. The PVRTX15UBT pushes out an impressive 2000 watts at peak power, putting out club quality beats from virtually any audio source through its RCA, USB, SD Card, AUX and Bluetooth inputs. This makes playing tracks from your iPod, USB Flash Drive or Bluetooth Compatible device a one step process without any additional connections or equipment! In addition to putting out booming sounds, the PVRTX15UBT gives you flawless sound clarity with 4 Piezo Tweeters, a 5”x15” horn with 2.5” voice coil and 50 oz. magnet, and a 15” woofer, 2.5” voice coil and 50 oz. magnet. This combination of tweeters, woofers and horns will give you the deep, thumping lows, solid mids, and the clearest highs with equal precision. Fine tuning your speaker output is a breeze with the 3- band Equalizer, which lets you balance your frequencies for the perfect sound design. Additional options such as Volume, Bass, Treble and Echo Controls will help you achieve the high resolution sound quality that lets everyone know you’re a pro. This speaker is a powerhouse of advanced features that will make your job as a DJ or MC easier than ever before. The USB and SD Card inputs can play .mp3, .wav and .wma files from drives of up to 32 GB. Staying on top of your tracks is never a problem, as the track title, track number and elapsed time will display for USB/SD Card inputs, along with a repeat / random playback option. You can even record .wav files onto a USB Flash Drive or SD Card from the Tuner & RCA inputs. However, what really sets the PVRTX15UBT apart from the competition is its Bluetooth compatibility, which allows for wireless connection to any A2DP stereo Bluetooth device within a 30 foot range- giving you yet another audio source option. There are also two ¼” microphone inputs with Volume, Bass, Treble and Echo Control- essential for large venue, outdoor or live events. The PVRTX15UBT is not only a professional grade sound system, it’s also an incredibly durable unit designed to last through the toughest conditions. Advanced components are housed in a carpeted box, which is protected by a full length perforated steel grill as well as reinforced steel protection on all corners. The 2 integral carry handles makes for easy transport, and set up at the venue is a breeze since the unit is stackable and comes with a single pole mount. The included remote control gives you the freedom to control the unit from anywhere in the room, so you can move around and interact with your audience all throughout the event. Whether you’re a DJ who needs to pump out hours of killer tracks in tight spaces, or a sound engineer who needs to put out big sounds for large venues, overheating will never be a concern thanks to the rear mounted fan that keeps the amplifier consistently cool. 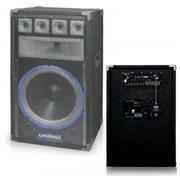 This speaker is the ultimate choice for those who need maximum sound output from a wide variety of modern sound sources. Jam packed with features based on the latest audio technology and built with the durability Technical Pro is known for, the PVRTX15UBT gives you unbeatable quality for an unbelievable price.